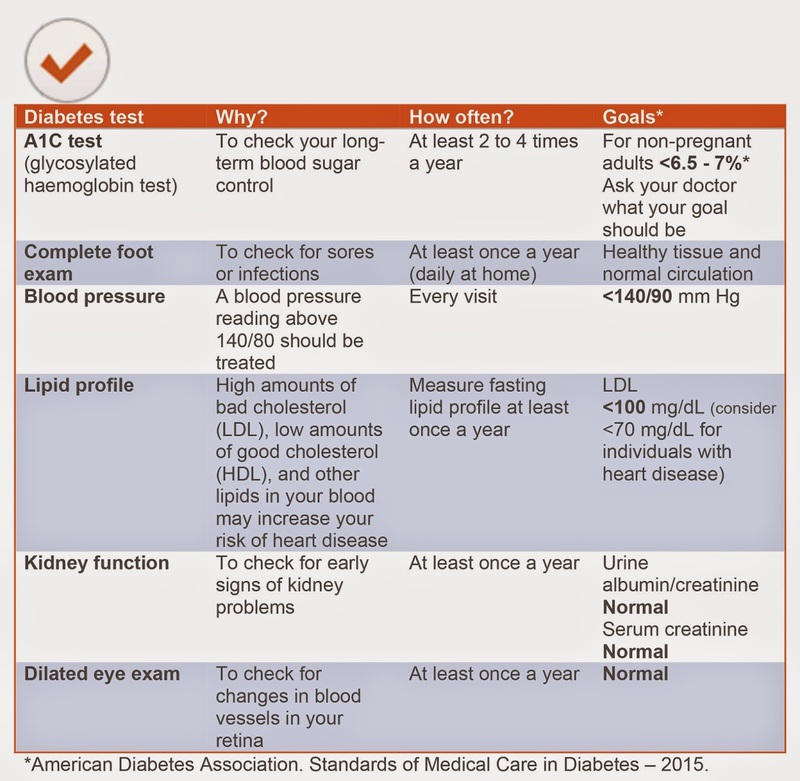 Recommended medical tests for people with diabetes. NEW 2015 updates! Diabetes changes over time, so it’s important to have regular checkups. Once you’ve been diagnosed, your doctor will arrange several diabetes tests both at the outset and in due course. If you haven’t had these tests or don’t understand what the results mean, be sure to talk to your doctor at your next appointment. Depending on your needs, your doctor may refer you to other health care professionals who specialize in managing particular aspects of diabetes. The goal of your diabetes health care team is to make sure you’re healthy—and that you stay that way. Each member of your team has the expertise to help you manage your diabetes. Be sure to inform everyone on your team that you have diabetes. A quick guide to various health care professionals who may contribute to your diabetes care. You can expect that some of the health care professionals below will be part of your diabetes care team. Here’s an overview of the roles they play. An ENDOCRINOLOGIST is a physician who has specialized training in diabetes and the hormone-producing glands and systems of the body. (S) He is the leader of the team. A doctor’s nurse collects valuable information for the doctor to review and may provide you with education and support. A physician assistant has special training to work closely with a doctor. A pharmacist can answer questions about your medications and about your blood glucose meter. A dentist can watch for signs of gum problems that can result from diabetes and provide advice to help you guard against gum disease. A diabetes educator may be a certified diabetes educator, a registered nurse, a registered dietitian, or a registered pharmacist who will teach you about diabetes and how to manage it. An ophthalmologist is an eye specialist who looks after your eye health. This health care professional has different training than an optometrist, who prescribes and fits eyeglasses. A podiatrist is a foot care specialist who will examine your feet and teach you how to examine your own feet. A registered dietitian will develop a food plan just for you by asking about your eating habits, for example, food you like and don’t like, and how much and how often you eat. Be sure your dietitian specializes in or is certified in diabetes education. An exercise specialist can help design an exercise program that’s right for you. A behavioral health professional can help you and your family work through any emotional stress you may feel as you adapt to living with diabetes.